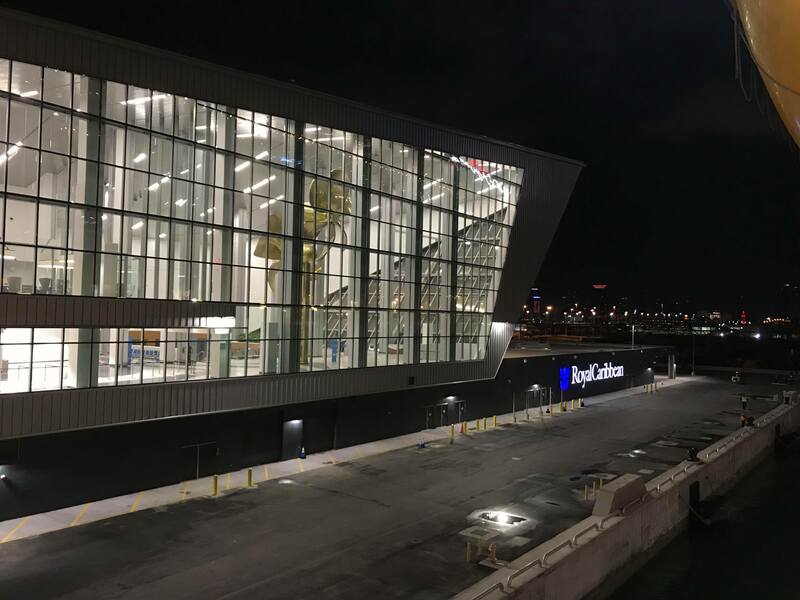 The Holiday Inn Port Of Miami-Downtown is located just a mile and a half from PortMiami, making it an extremely convenient place to stay before or after a Royal Caribbean cruise. 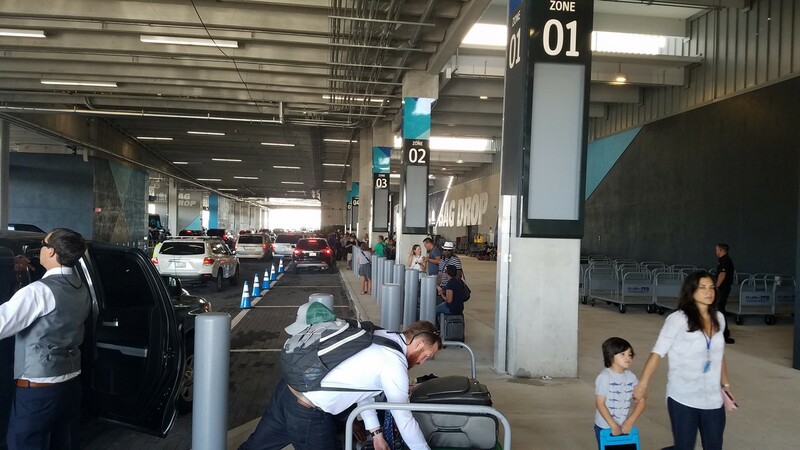 This review features photos of the room & hotel, thoughts on the amenities, and our experience in staying here during our recent visit to the Miami area. The primary rationale for picking this hotel is simply its location. 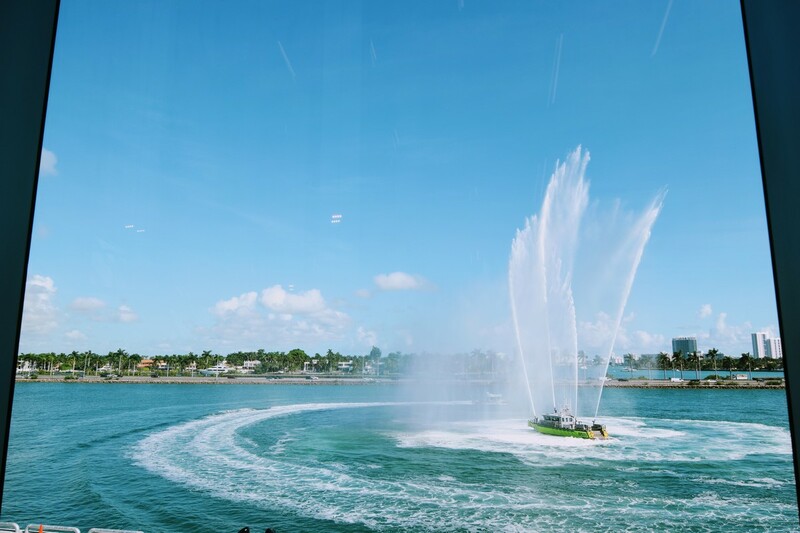 Being right on Biscayne Boulevard means you can practically see the cruise ships from the hotel's higher floors. 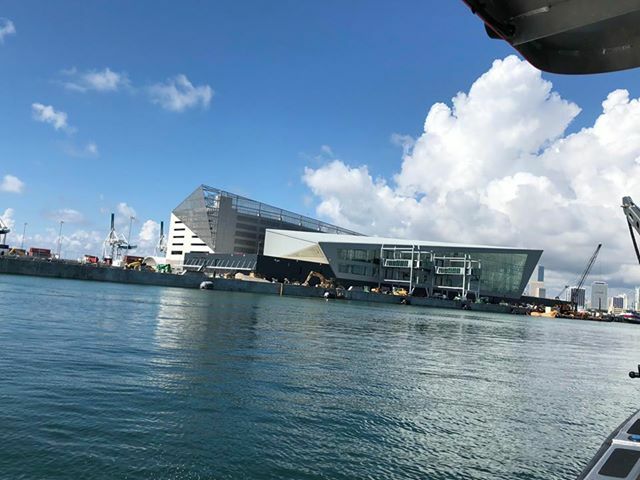 In fact, step outside the hotel in the afternoon and you are likely to hear a ship's horn as it conducts muster drill. 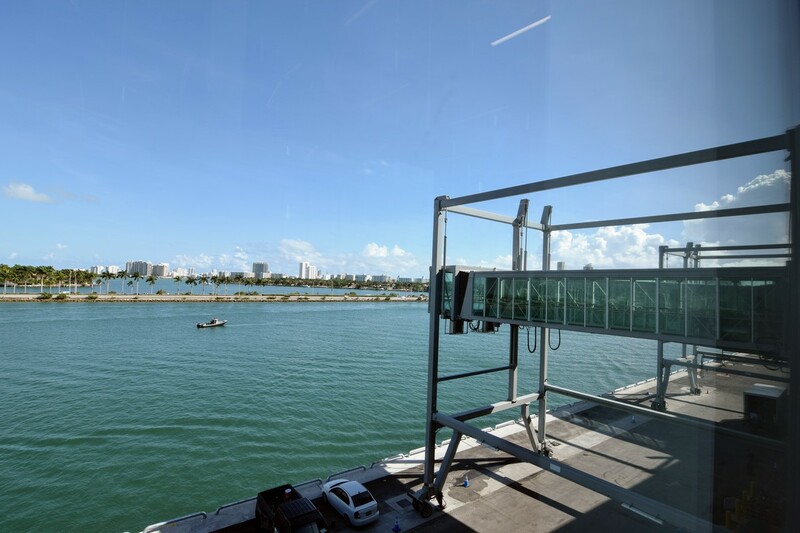 The proximity to PortMiami makes this Holiday Inn an appealing choice. 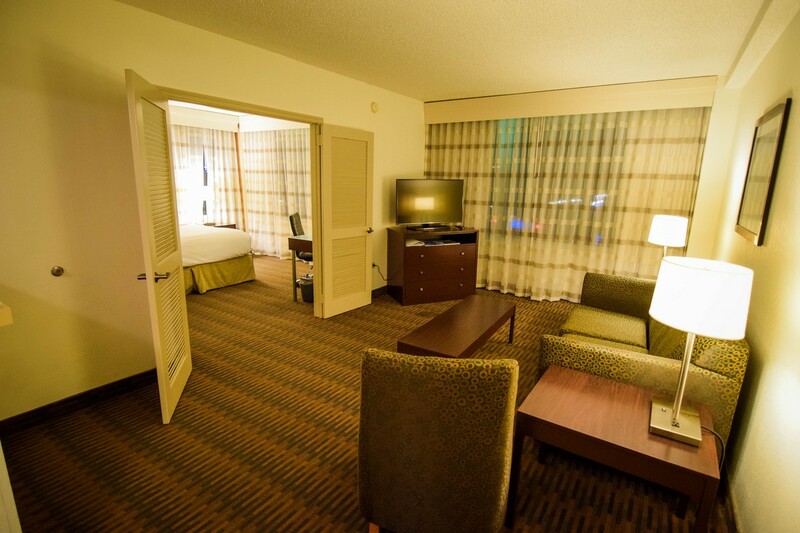 The hotel offers 200 rooms, including eight "Bayview" suites, and is located in the heart of Downtown Miami. 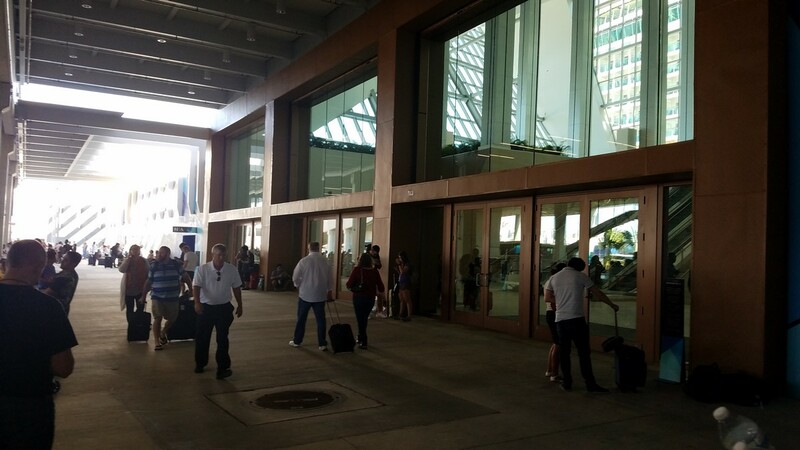 You can easily walk outside the hotel and check out various shops, hop on the Metro Mover (the city's monorail), or walk across the street to the Bayside Market. In my opinion, being downtown is a double edged sword. 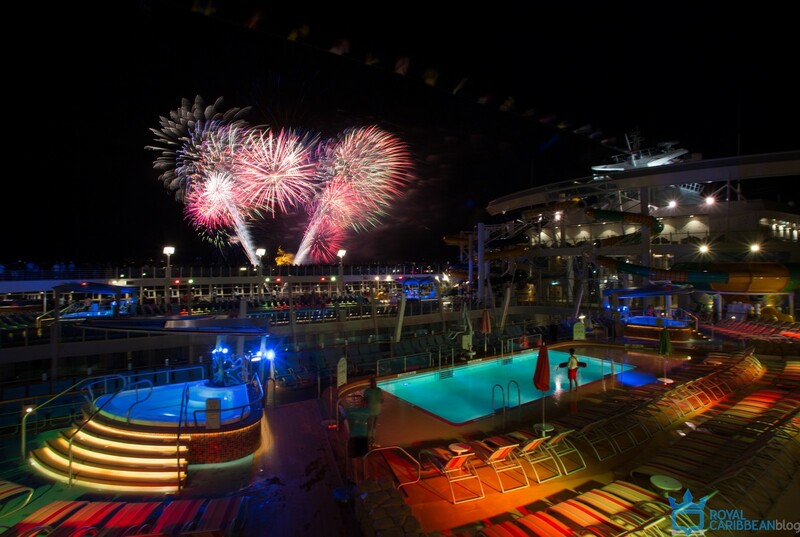 You are incredibly close to the cruise port, and there is lots around you to explore. 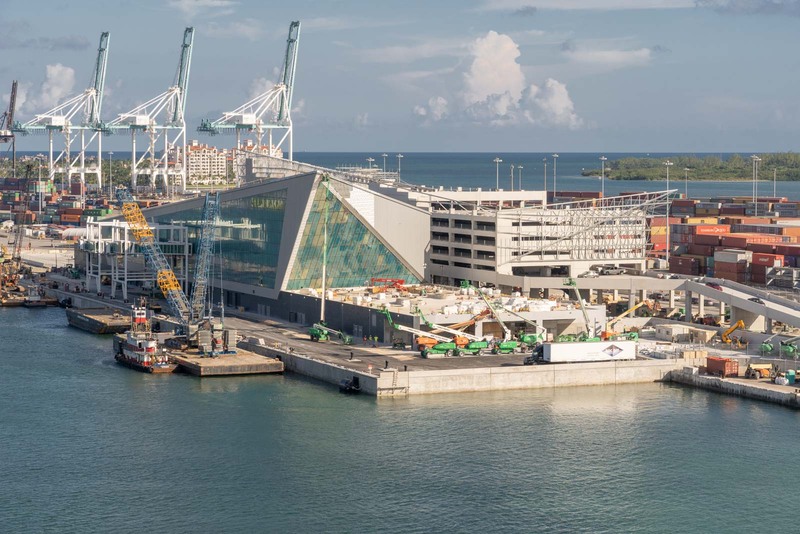 However, downtown Miami like so many major cities has its share of issues. 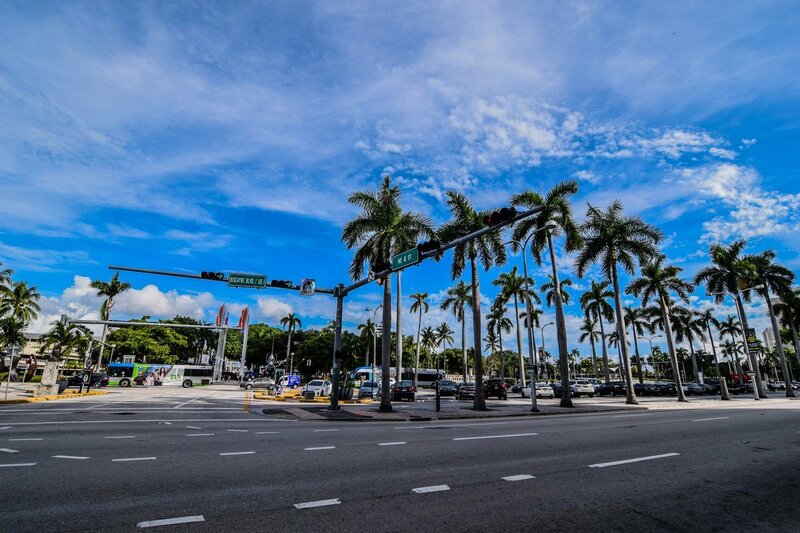 In the grand scheme of neighborhoods in and around Miami, downtown is not necessarily the most tourist-laden spots you will find. 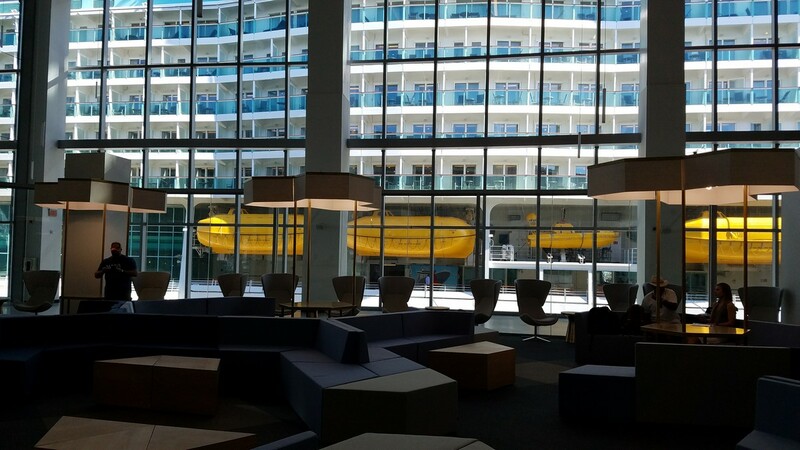 Being a Holiday Inn hotel, walking into the lobby reminded me of so many other Holiday Inn hotels. 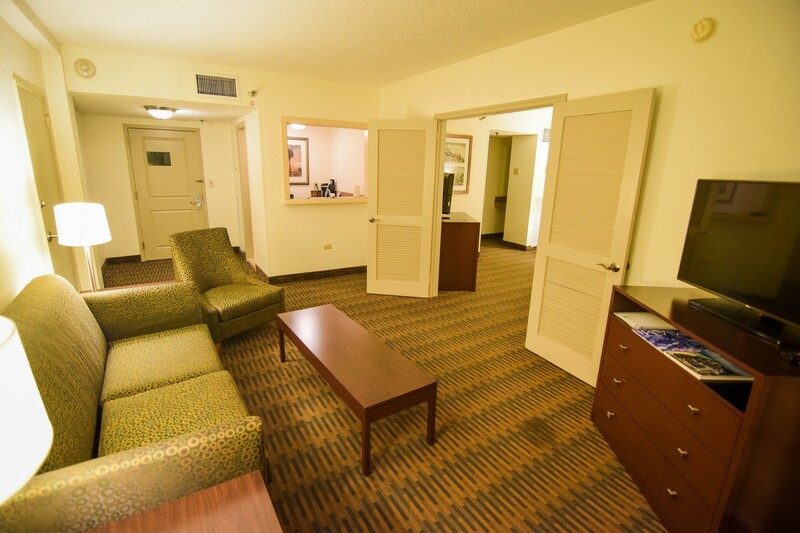 It features a lot of characteristic greens and other Holiday Inn decor. 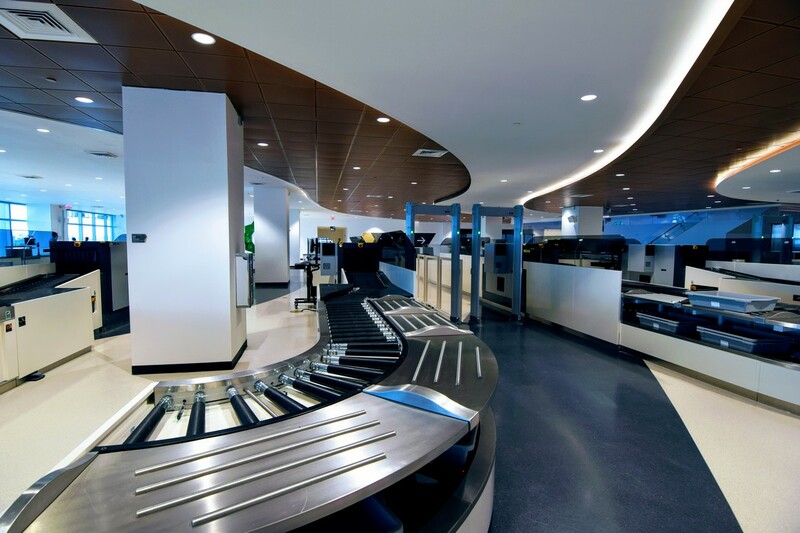 Anytime I walked past the Front Desk or had a need to stop by, there seemed to be little to no lines. 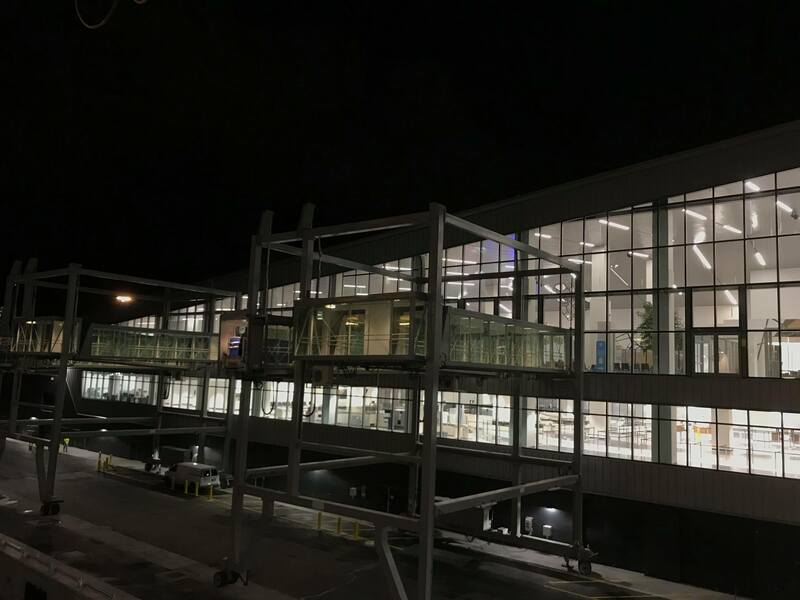 This location offers an outdoor pool, business center, complimentary health & fitness center, WiFi (free for IHG members, which is free to sign up for) and daily housekeeping. I booked a King Suite Nonsmoking room for my stay. It was located on the third floor at the end of the hallway. The rate for the first night was $179.55 and the second night was $231.83. 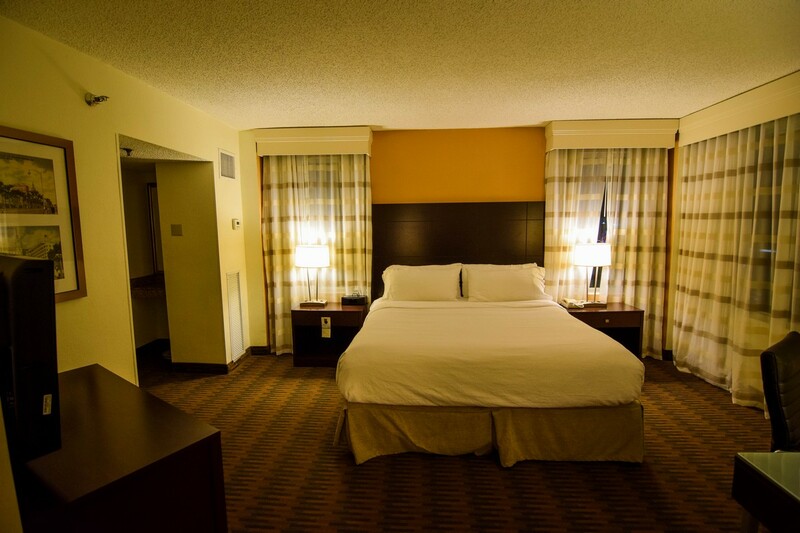 If you had booked a regular room, you can easily find rates closer to $110-$150 per night. Upon walking into the room, it is indeed quite massive. 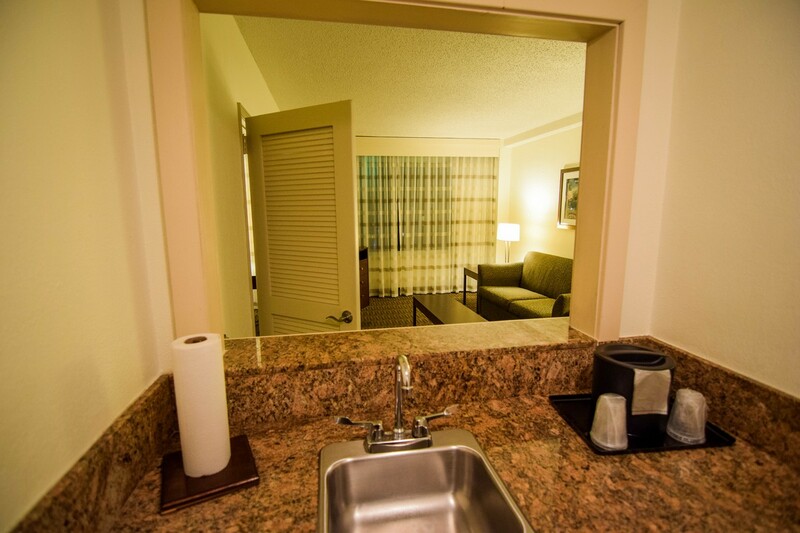 There is a very large living room, small kitchenette, sprawling bedroom, bathroom and closet. The living room has plenty of space, and would be great for kids to sleep on the pull out couch. I like the fact the living room and bedroom are separated by a set of doors. 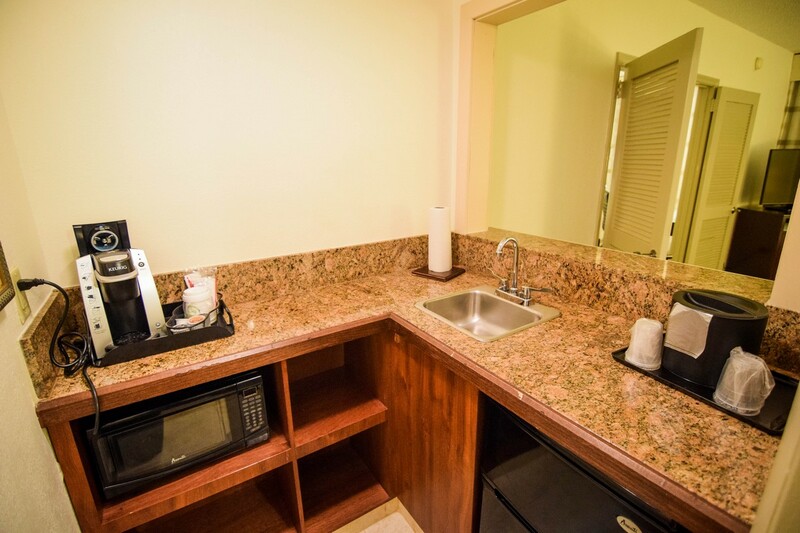 The kitchenette is quite small, but functional. There is a fridge, freezer, sink and microwave. Perfect for storing and reheating food that you will likely get if you are staying a few nights. 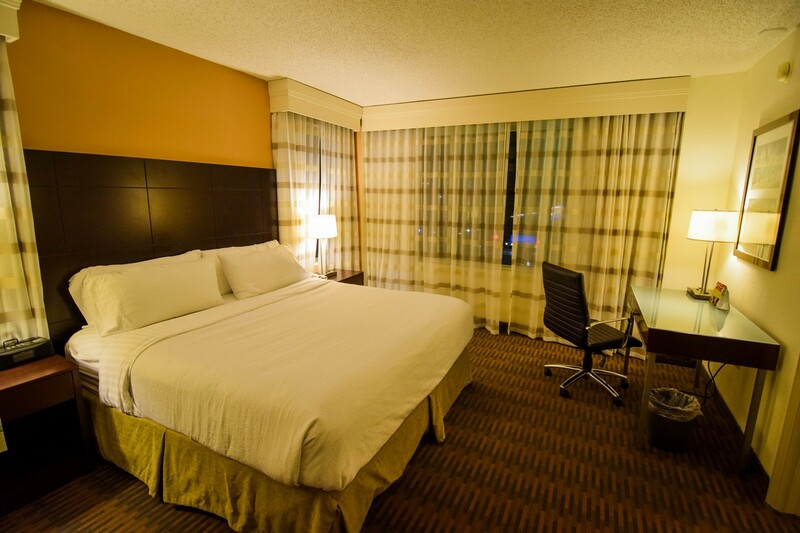 The bedroom has a king size bed, along with a large desk area that was perfect for doing work. The bathroom seemed to have been more recently updated than the rest of the room. Its lights were brighter, and the floor and tub appeared to have been replaced. 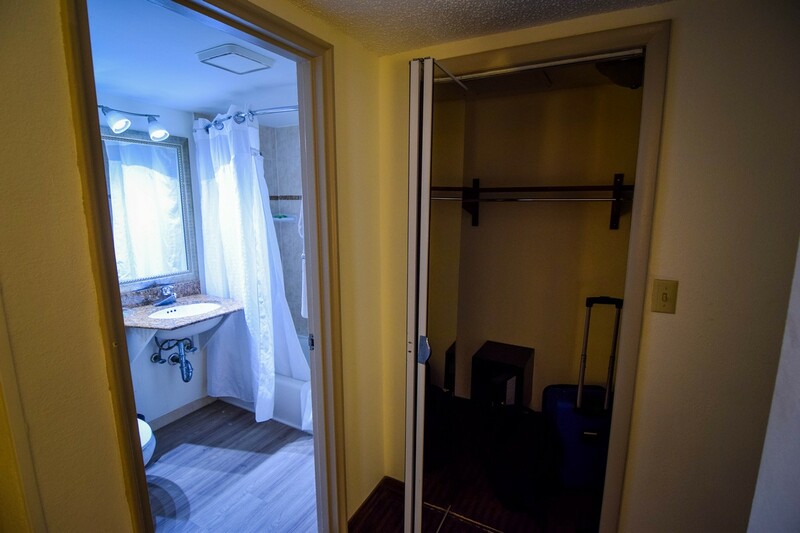 The room offered a lot of living space and was clean. It is worth noting that there was an odd smell to the room, which I never complained about because within a few minutes I stopped noticing it. But anytime I left the room and came back, I would note the smell. If I had to describe the smell, I would probably peg it as a putrid, but I seemed to adjust quite quickly. I also have no idea if any other rooms had this experience, but I figured I would note it. I would also note that the room felt a bit old. 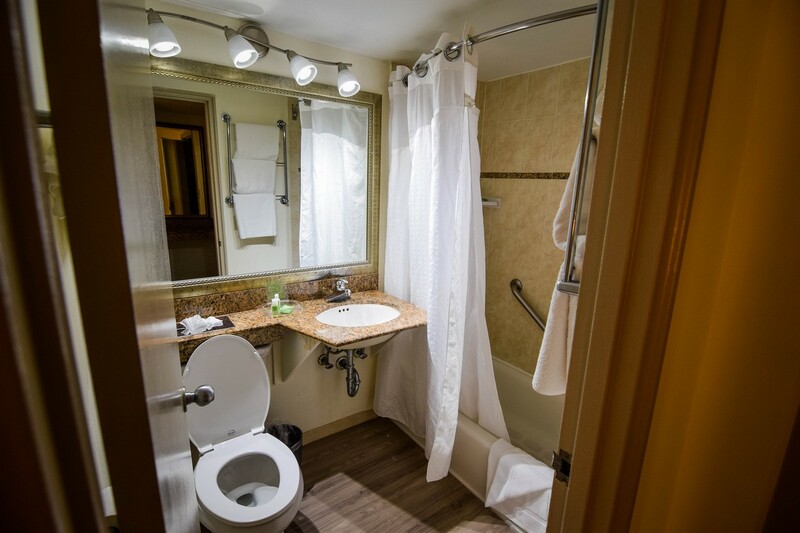 It was well maintained and certainly clean, but you can tell this is not a new construction hotel. Some of the room walls had that look and feel of being repainted a few times. This is by far not a problem, but I know some people prefer newer hotels. 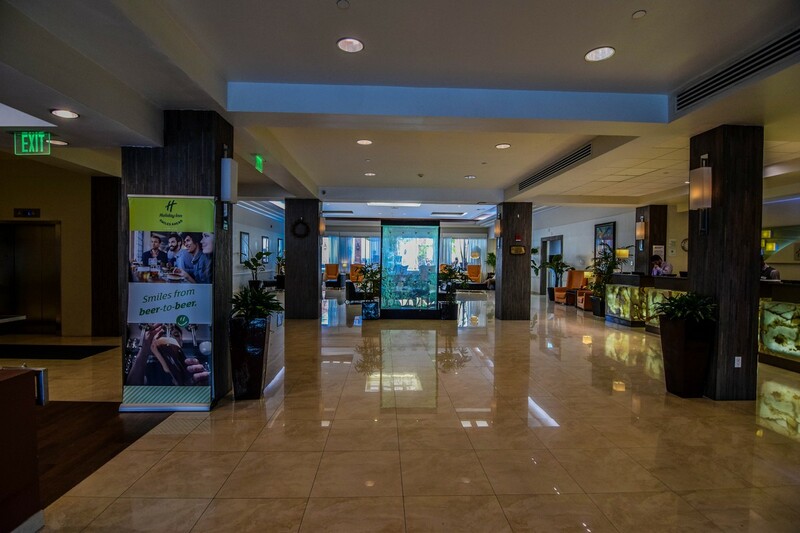 Overall, the Holiday Inn Port Of Miami-Downtown hotel fit the bill of what many look for in any pre- or post-cruise hotel, which is somewhere clean, safe and moderately priced. 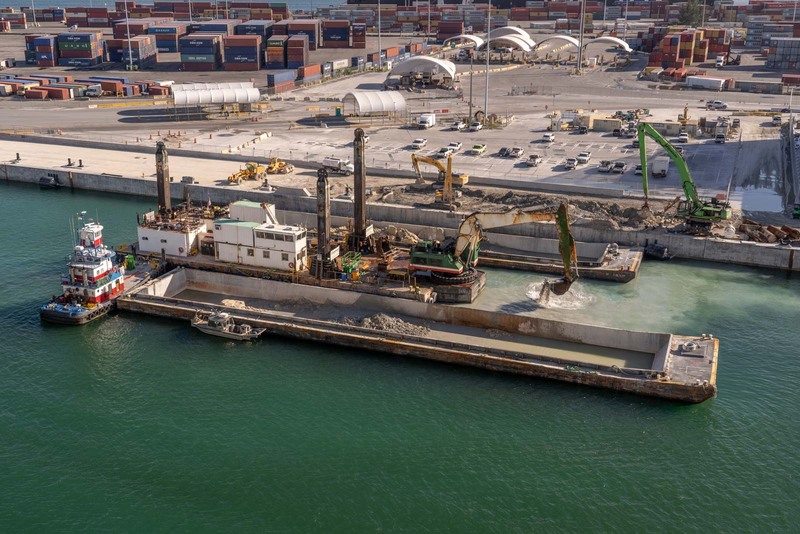 It is a very utilitarian spot to stay that will get you about as close as you can get to PortMiami. 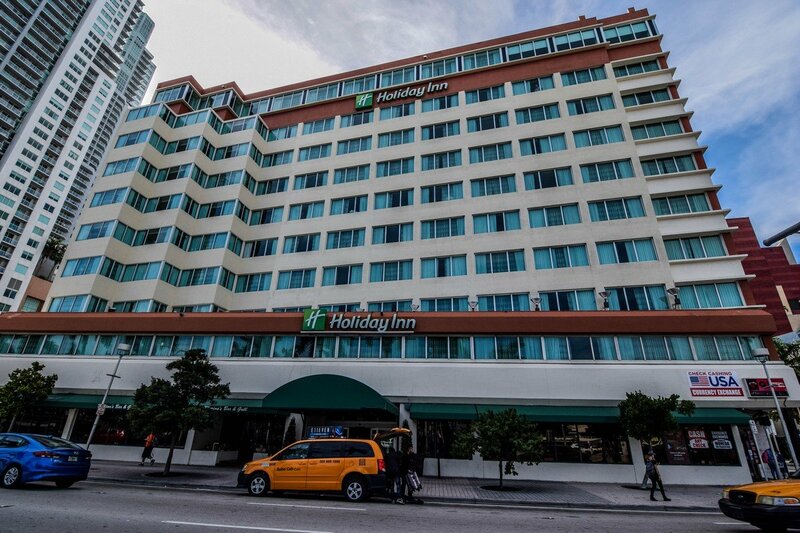 Have you stayed at Holiday Inn Port Of Miami-Downtown? Are you a fan of it? 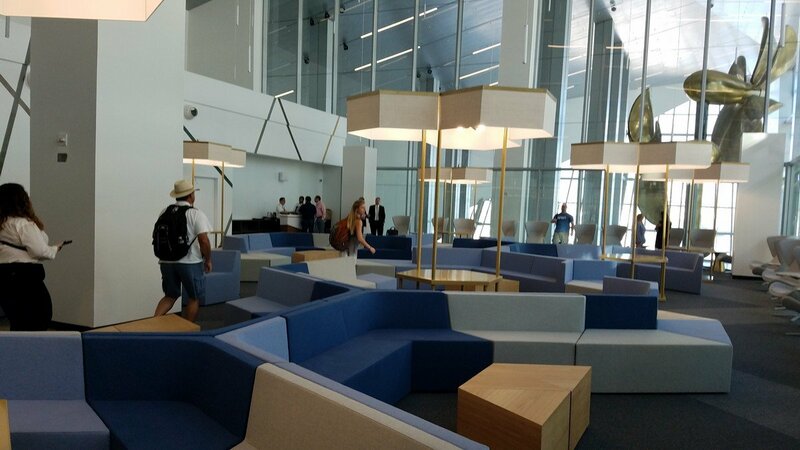 What did you think of the suites? 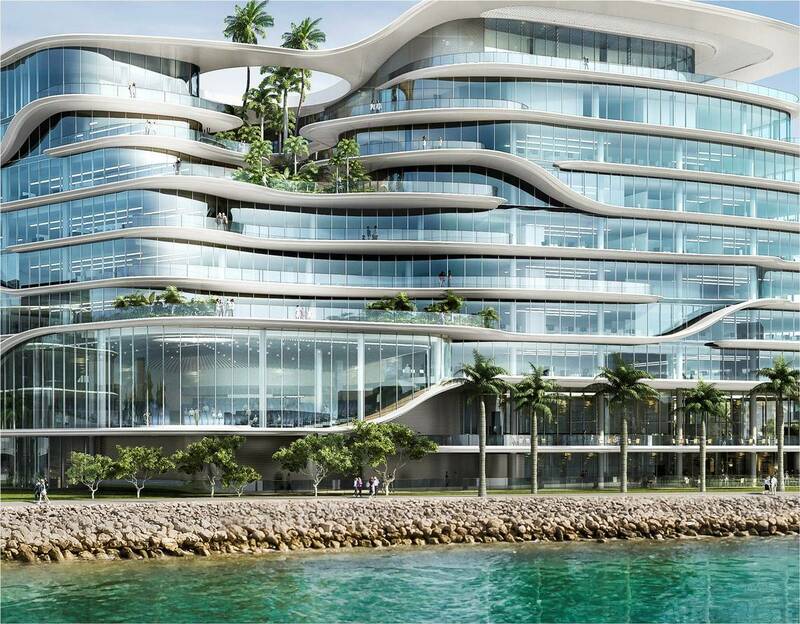 Is this a hotel you’d consider? Please share your thoughts or questions in the comments section below! 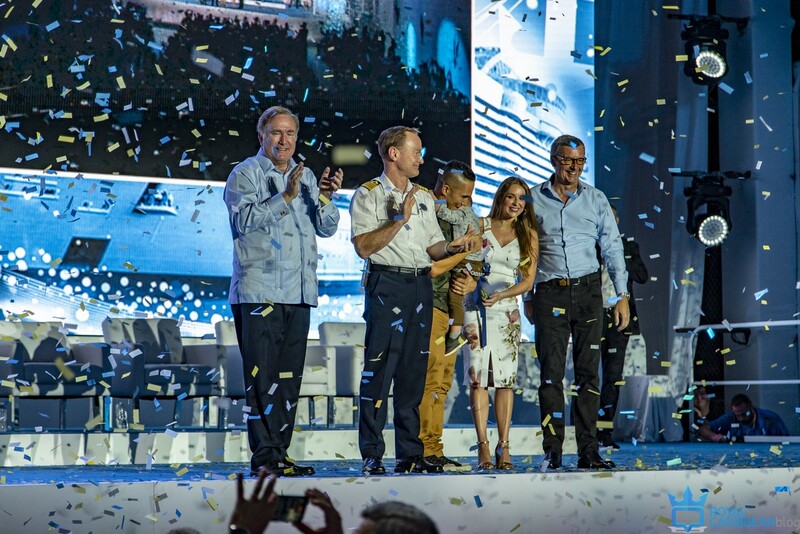 Royal Caribbean formally opened its new cruise terminal in PortMiami with a celebration event held inside Terminal A. 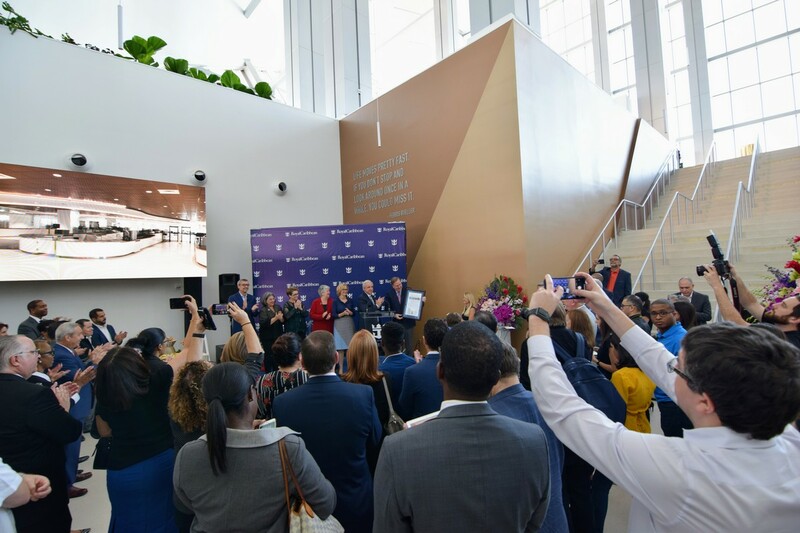 The event was headlined with speeches by Royal Caribbean's leadership, as well as Miami city and PortMiami officials. 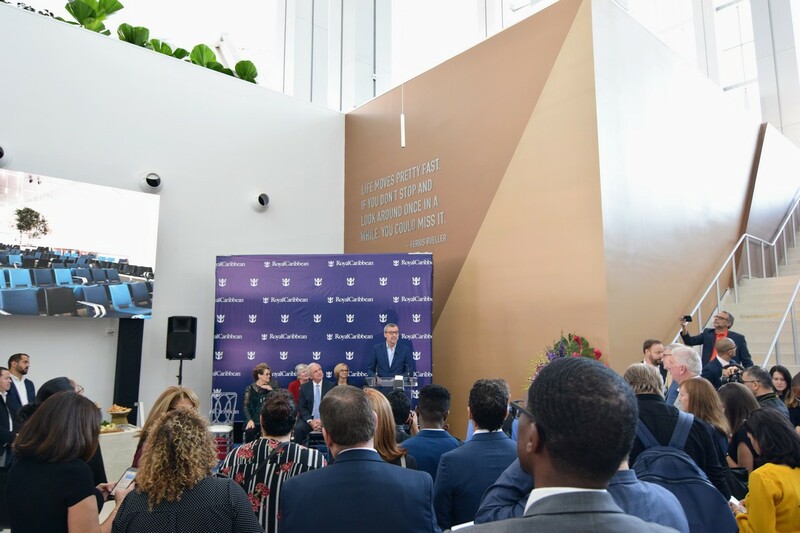 Richard Fain, Chairman & CEO of Royal Caribbean Cruises Ltd. started off the day talking about what this new terminal means to the cruise line. 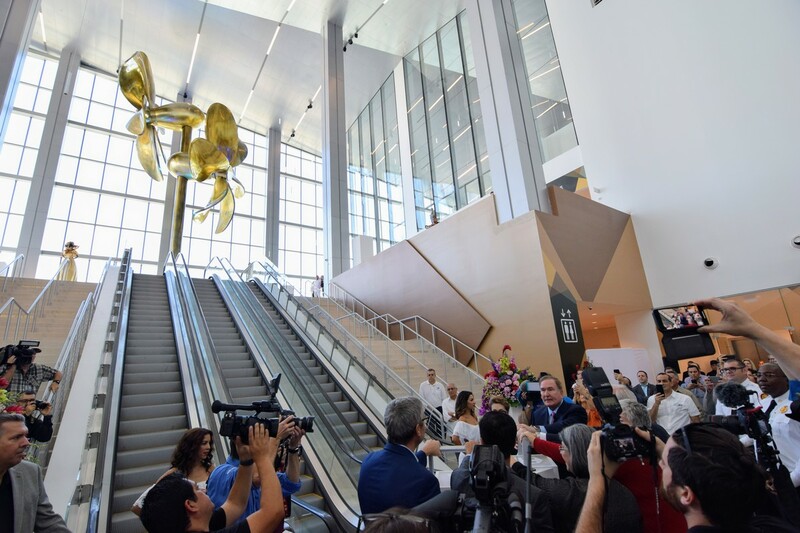 Miami Mayor Carlos Gimenez and Commissioner Rebecca Sosa, Chairwoman for the Economic & Tourism Committee, both congratulated Royal Caribbean on the opening of this terminal, and declared today to be Royal Caribbean day in Miami. 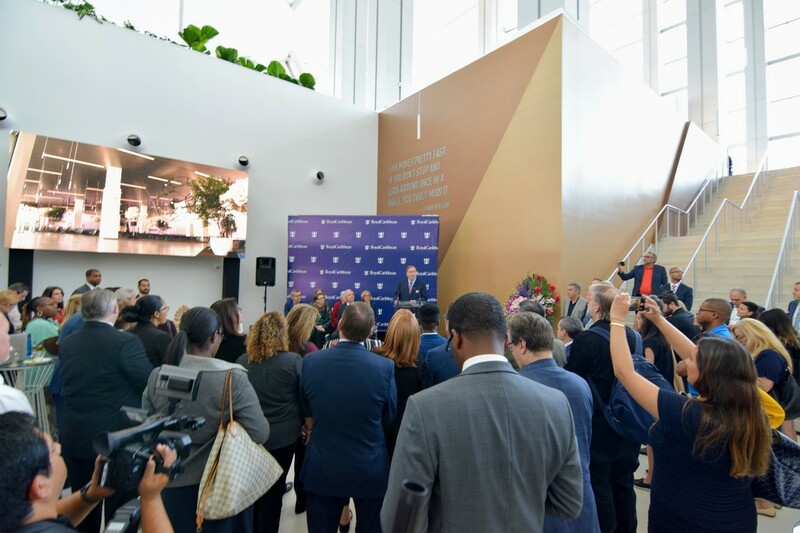 Michael Bayley, President & CEO of Royal Caribbean International, also said a few words at the event. 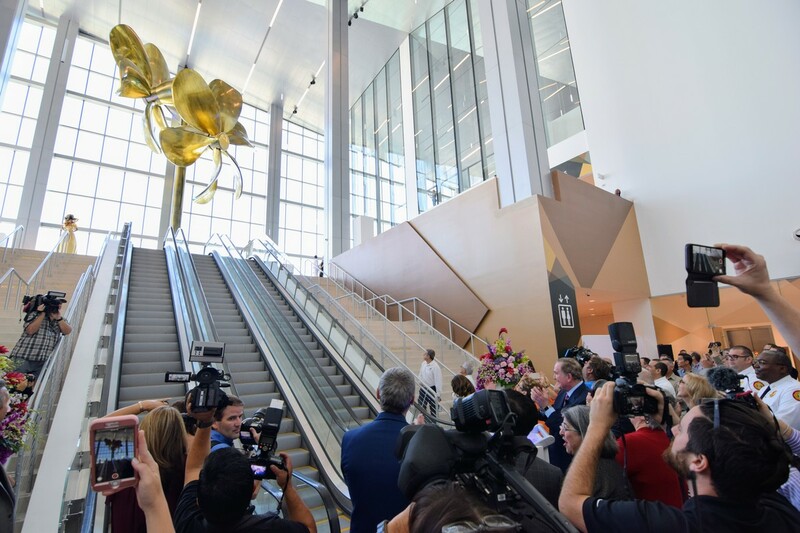 The official opening saw Royal Caribbean's leadership, along with the Mayor of Miami and other city officials, activate the 56 foot tall gold propellors to welcome everyone into the terminal. 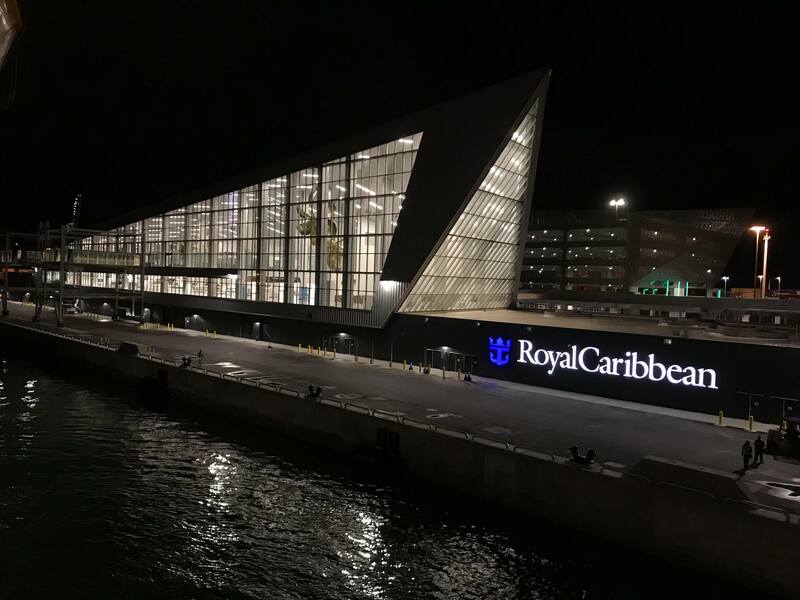 Terminal A is a brand new, state-of-the-art cruise terminal that was built to be the home of Royal Caribbean's newest cruise ship, Symphony of the Seas and her sister, Allure of the Seas. 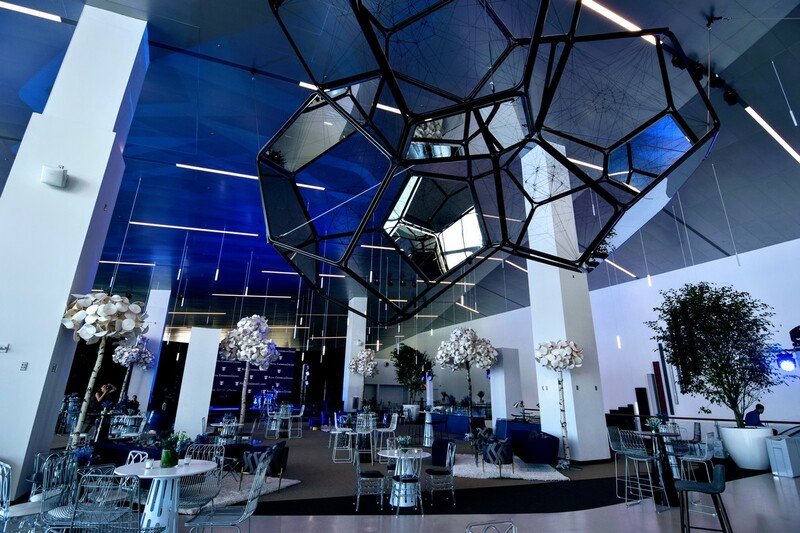 The building was designed by England-based global architecture firm Broadway Malyan. 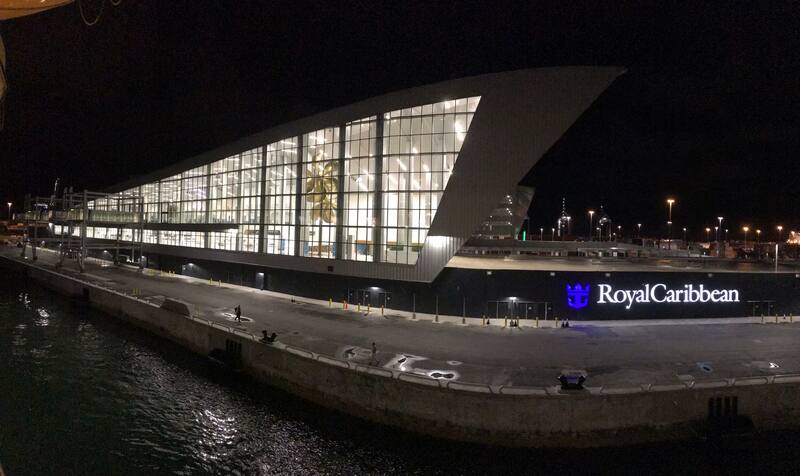 The names of Royal Caribbean ships appear on the staircase. A fire department celebration of the special day. 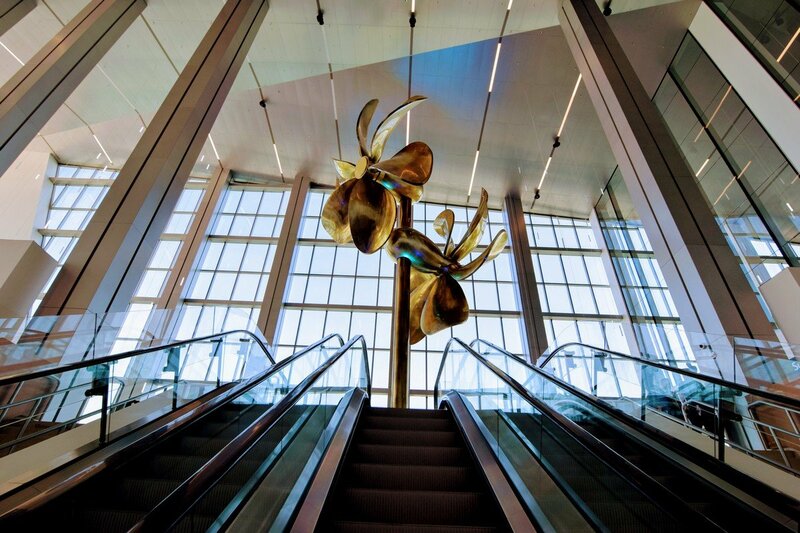 The 170,000-square-foot terminal is nicknamed the ‘Crown of Miami’ because of its distinct shape. 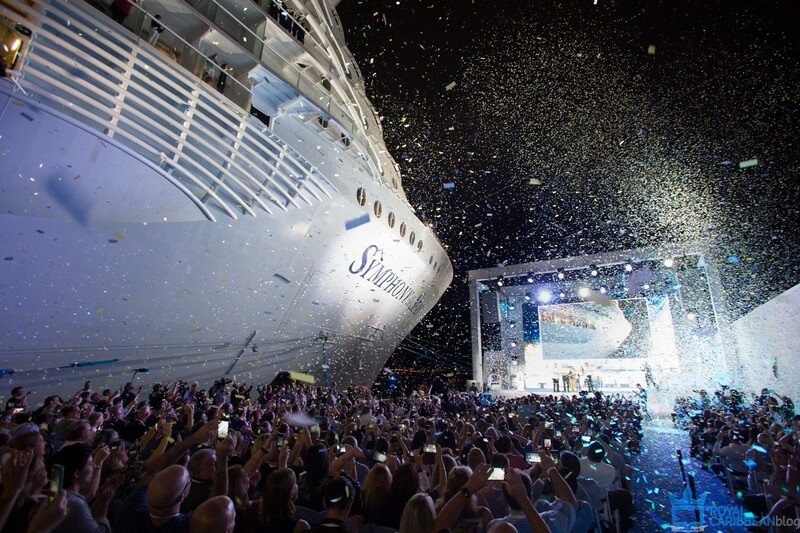 Symphony of the Seas arrives to Terminal A on November 9, 2018. 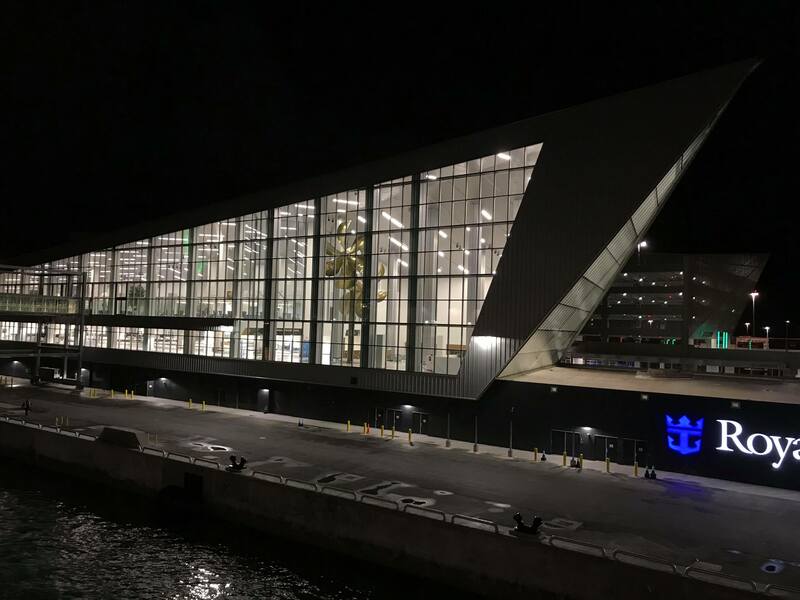 The largest and most modern cruise facility in the world welcomed its first guests this morning as Royal Caribbean's Mariner of the Seas docked at Terminal A in PortMiami earlier today. 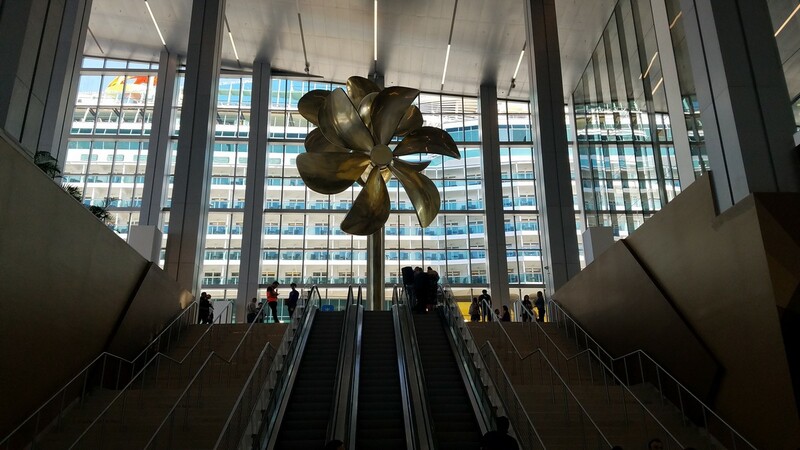 As you come into the terminal, there are multiple escalators and stair cases in front of you with the large, golden propellor blades. 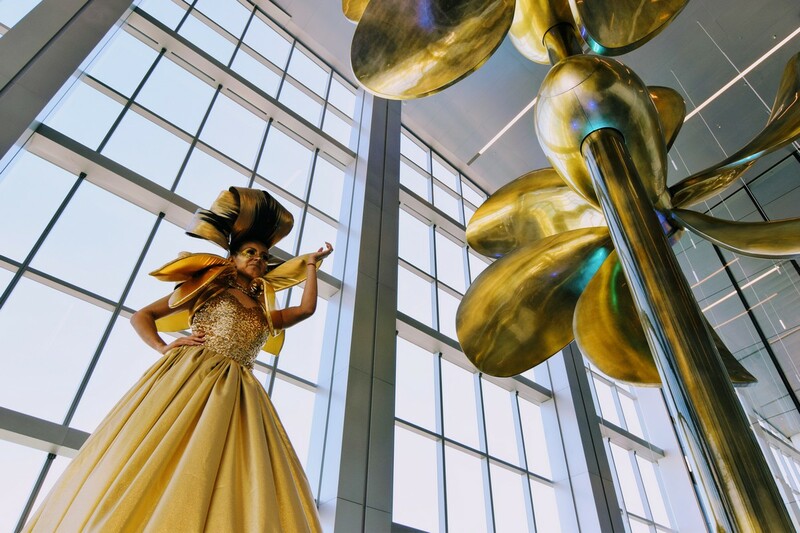 The gold propellors weigh in at 15,000 lbs. 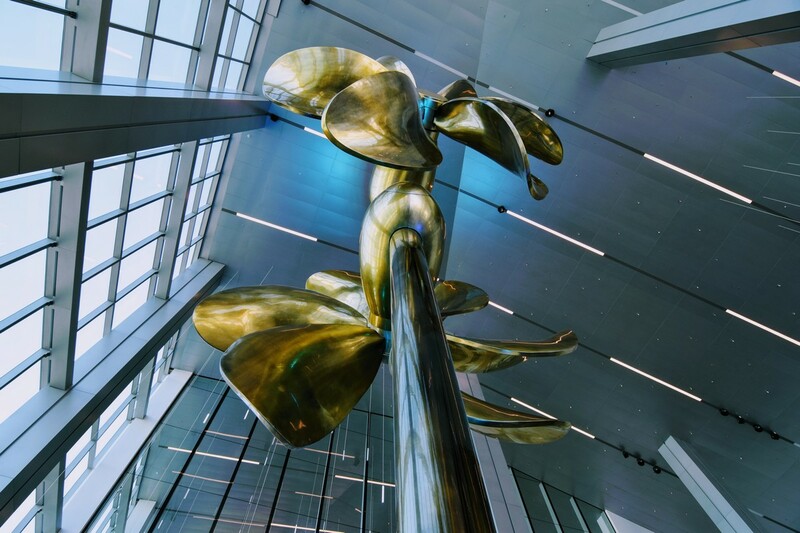 and are 56 ft. tall. 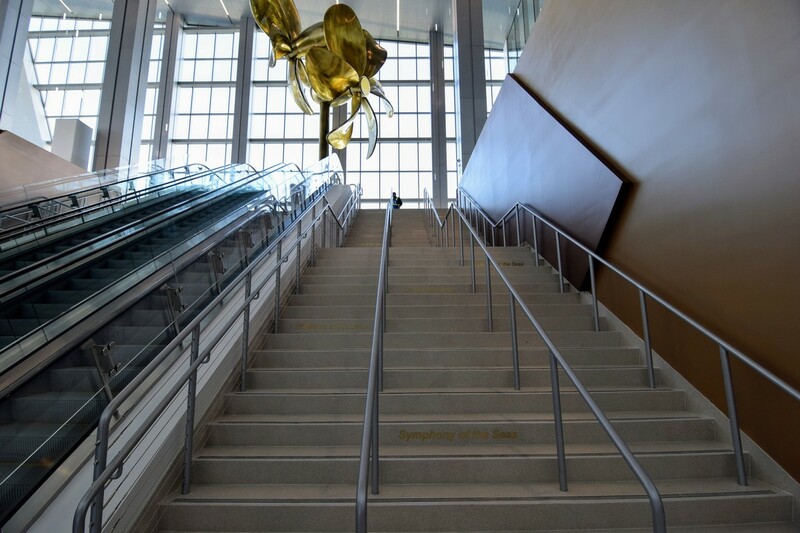 Once at the top of the stairs, the general boarding area is to your right. 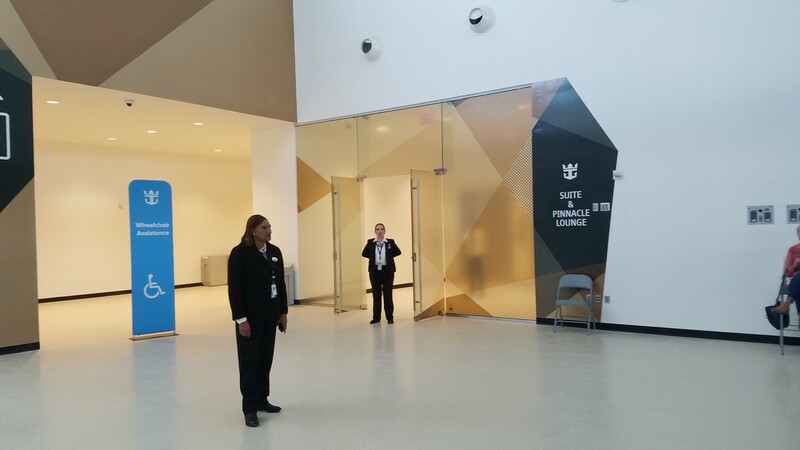 Back at the bottom of the stairs, to the right is the entry to the suite/Pinnacle area. 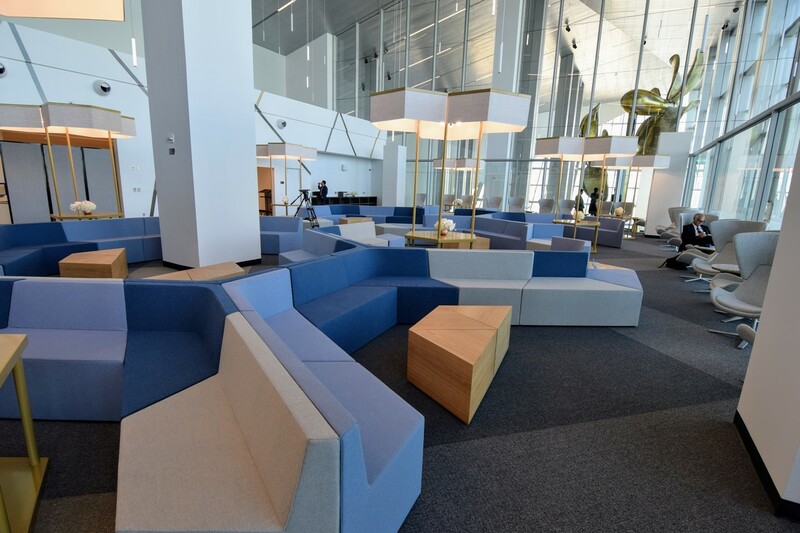 An elevator takes you to the third floor, then you go through security before entering the Suite Lounge. 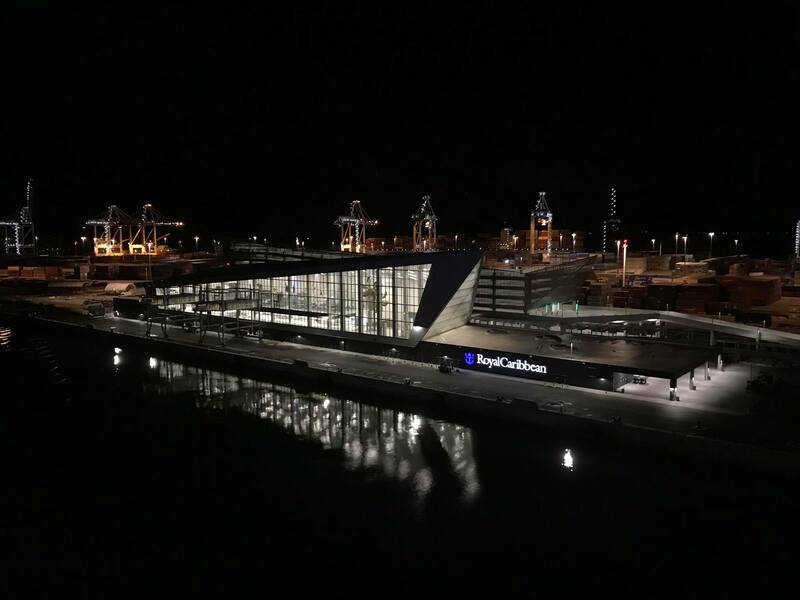 As Mariner of the Seas arrived into port early this morning, Nancy Ritter shared these photos with us of the terminal beautifully lit up. 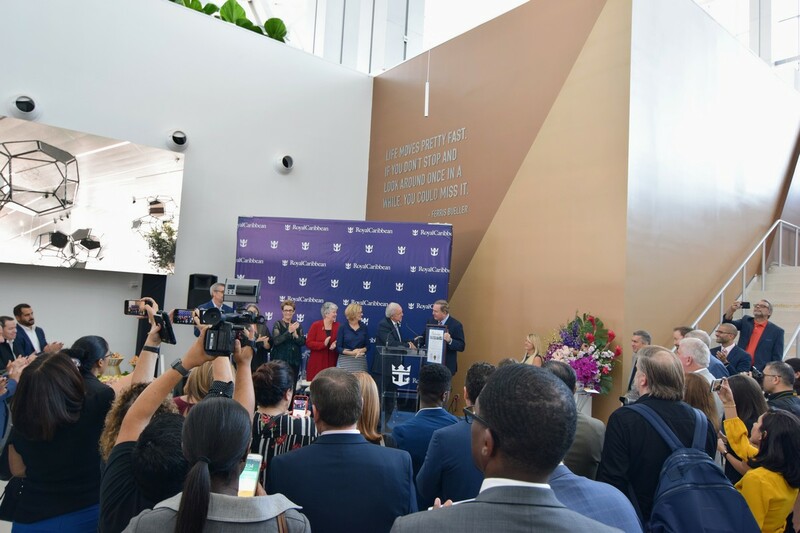 In addition to housing two of the world’s largest ships, the new LEED certified facility, it has implemented new technologies and waiting areas to enhance the boarding experience of guests. 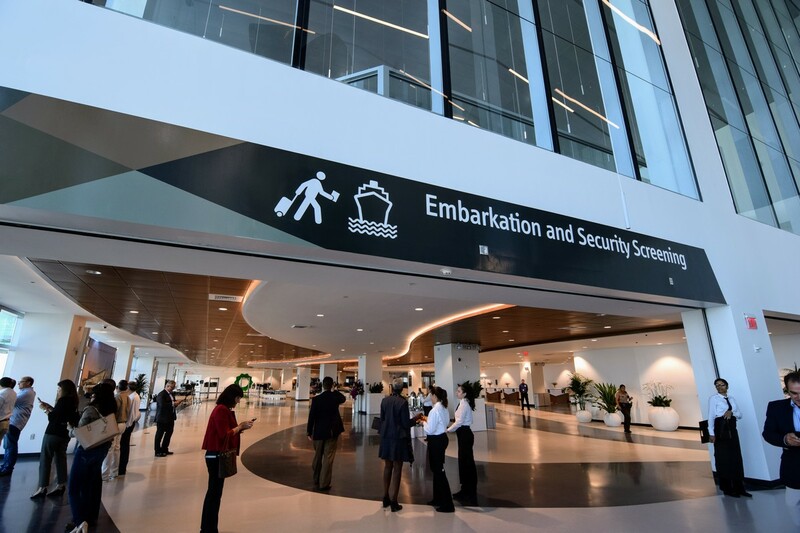 A grand opening ceremony is scheduled for November 2nd, 2018 that will formally open the the new terminal to the public. 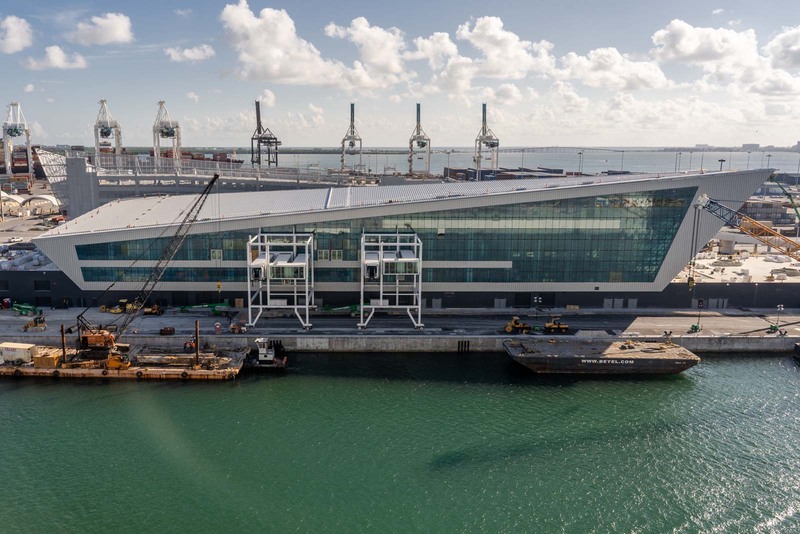 Symphony of the Seas arrives to Terminal A on November 9, 2018. 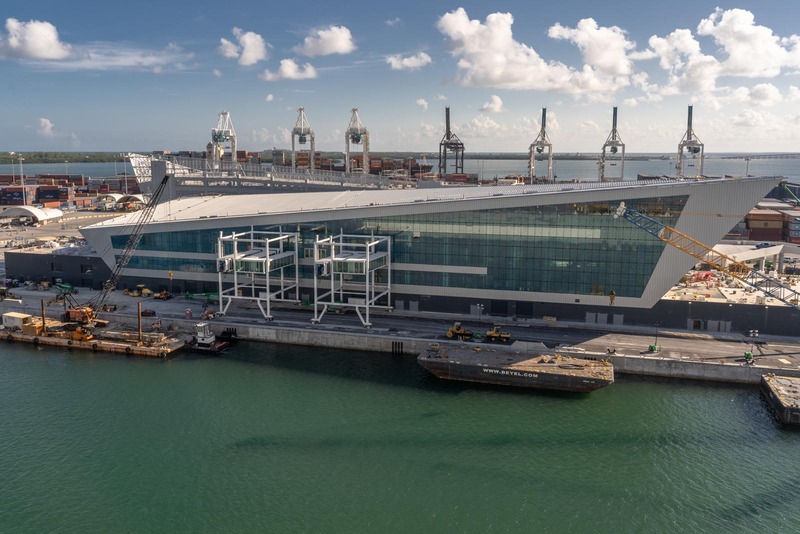 Royal Caribbean has begun notifying guests sailing on upcoming Mariner of the Seas sailings that their cruise will make use of the brand new cruise terminal the cruise has built in PortMiami. 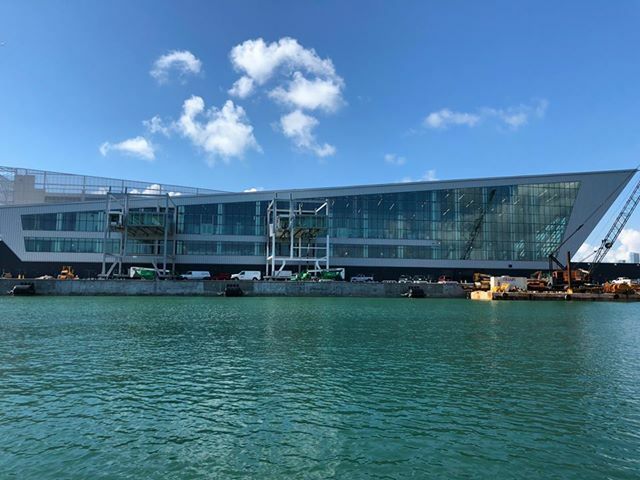 Terminal A is a brand new, state-of-the-art cruise terminal and the October 26, 2018 Mariner of the Seas sailing will make use of the port when she returns to Miami. 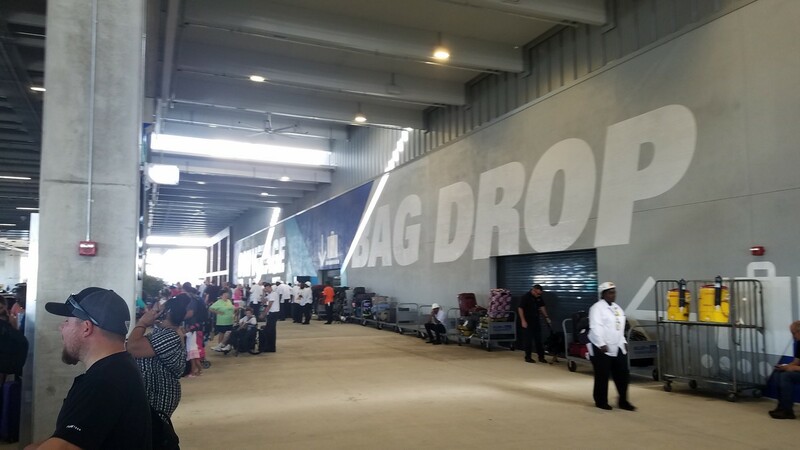 The cruise will begin from Terminal G, but return to Terminal A. Thanks to Nancy Ritter for sharing this screenshot. 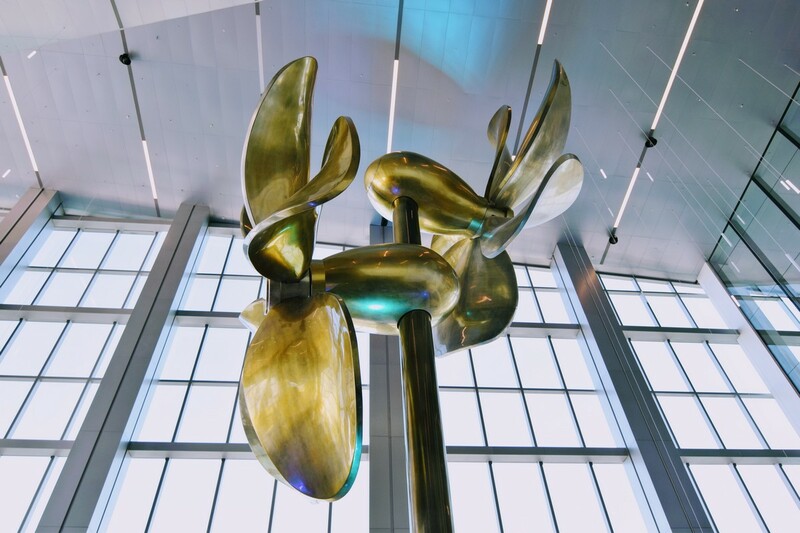 The terminal will feature stunning architecture, a new boarding experience, and an impressive gold propellor that is 15,000 lbs. and 56 ft. tall. 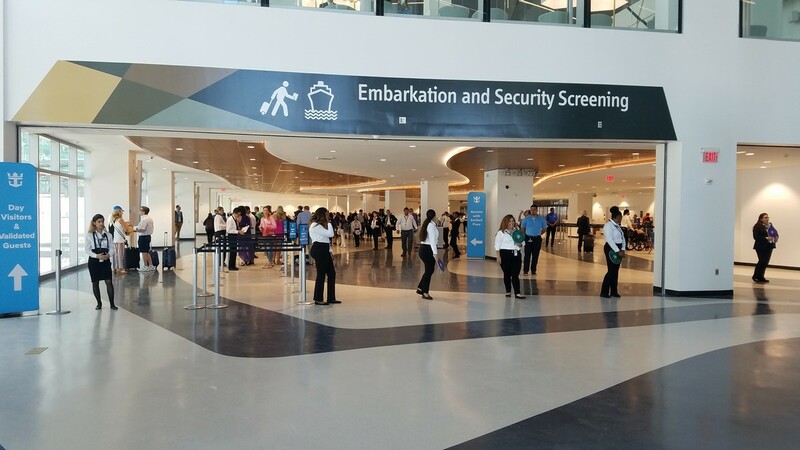 Terminal A was designed to accommodate the passengers of two of the world’s largest ships, the new Symphony of the Seas and her sister, Allure of the Seas. 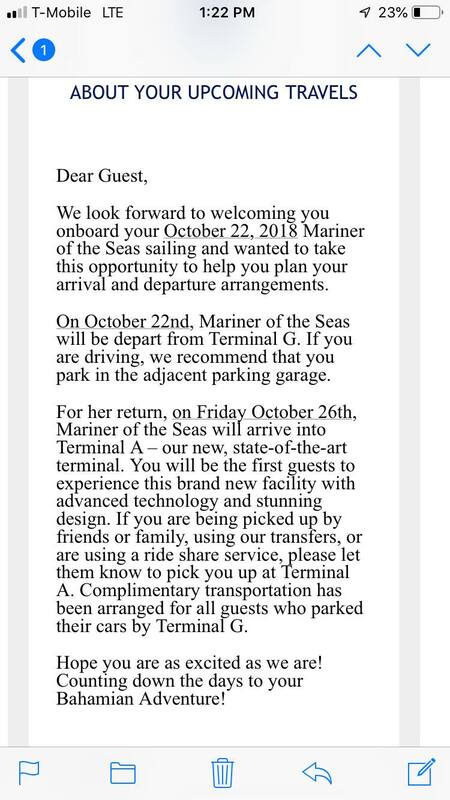 Guests sailing on other Mariner of the Seas sailings received emails informing them that they too will be cruising to and from the new terminal. 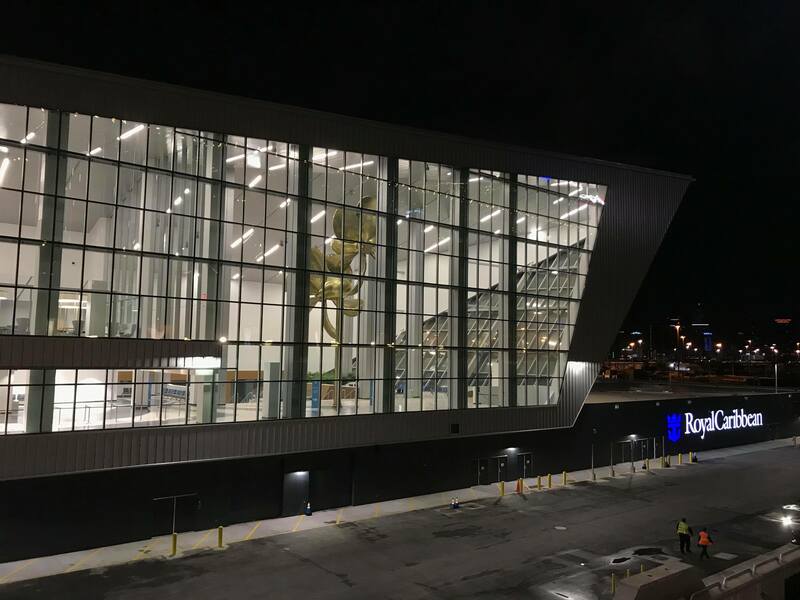 A grand opening ceremony is scheduled for November 2nd, 2018 that will formally open the the new terminal to the public. 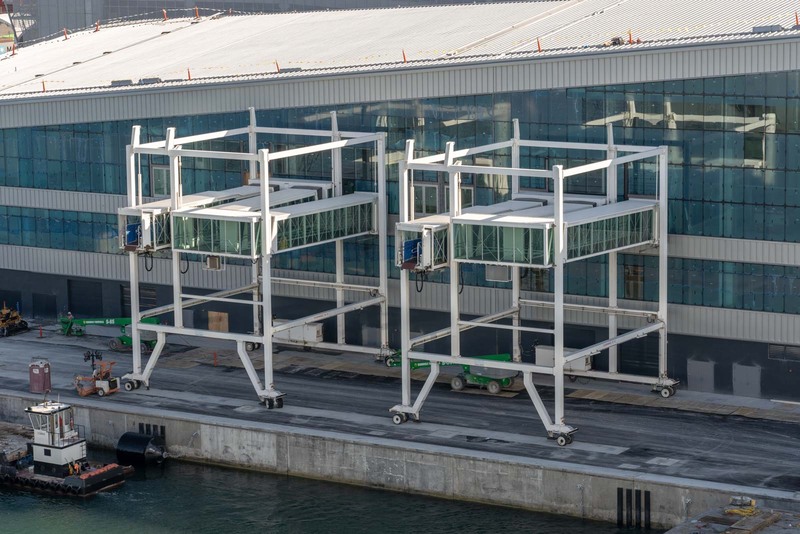 With just a few until Royal Caribbean opens its brand new cruise terminal in PortMiami, we have a look at the progress being made on Terminal A.
Royal Caribbean Blog readers Trina and Danny Martinez shared with us these photos of the new cruise terminal, which were taken as the cruise departed PortMiami yesterday. 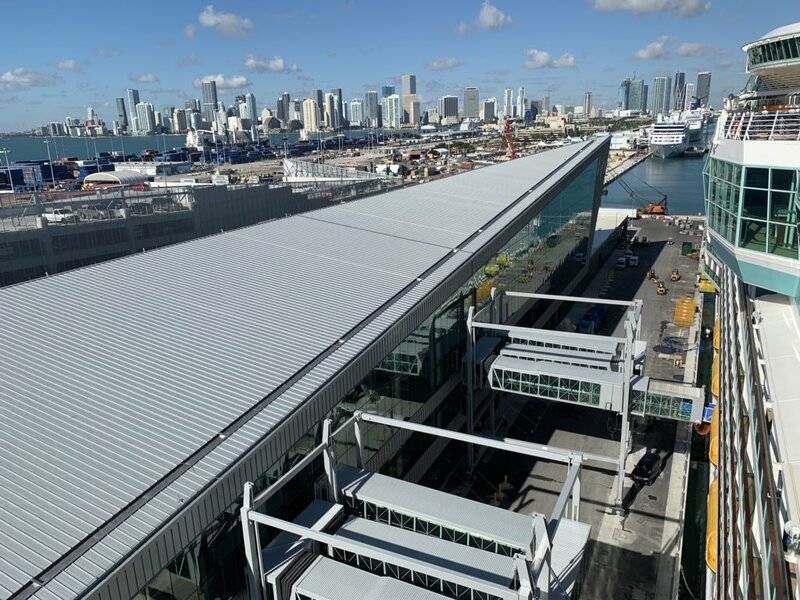 A grand opening ceremony for Terminal A in PortMiami is scheduled for November 2, 2018. 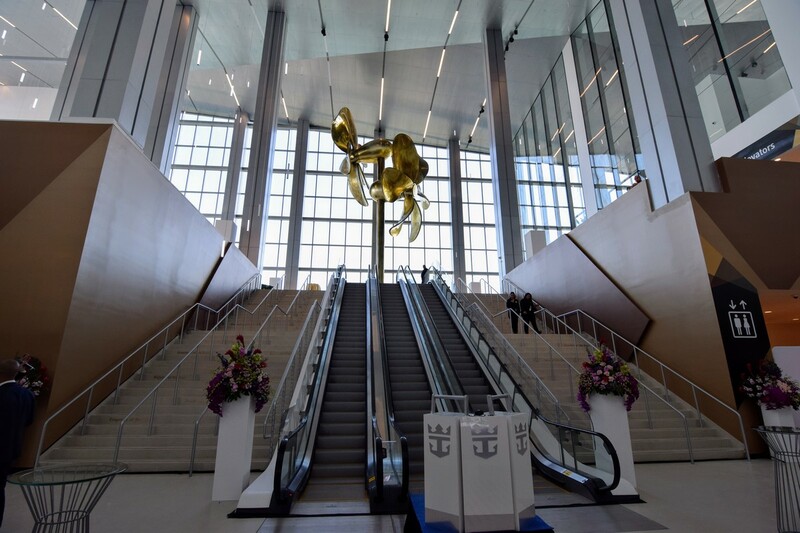 Terminal A was designed to accommodate the passengers of two of the world’s largest ships, the new Symphony of the Seas and her sister, Allure of the Seas. 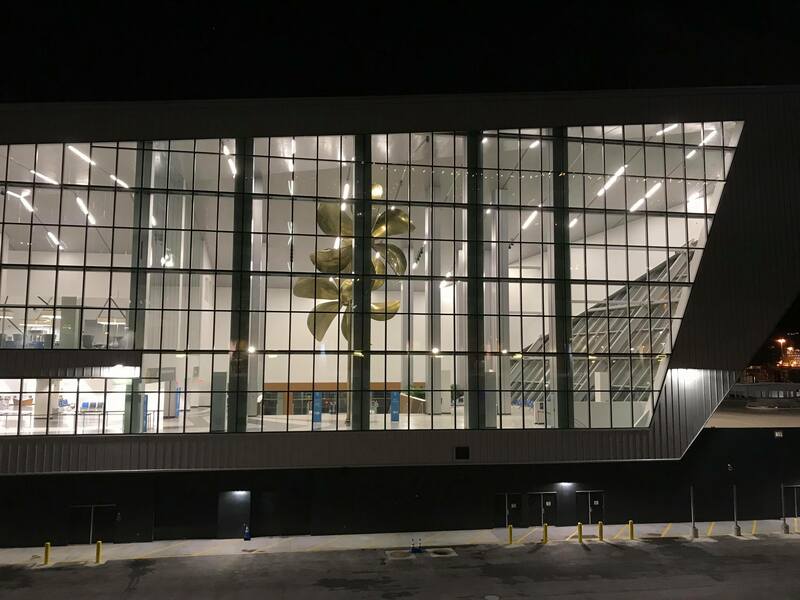 In addition to housing two of the world’s largest ships, the new LEED certified facility, which will soon be the largest and most modern cruise facility in the world, has implemented new technologies and waiting areas to enhance the boarding experience of guests. 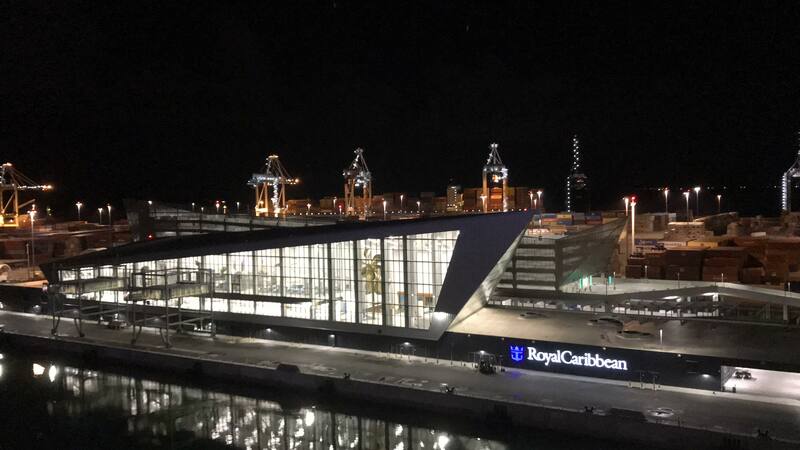 As a result of the new terminal, Royal Caribbean is expected to increase its passenger intake by 1.8 million annually. 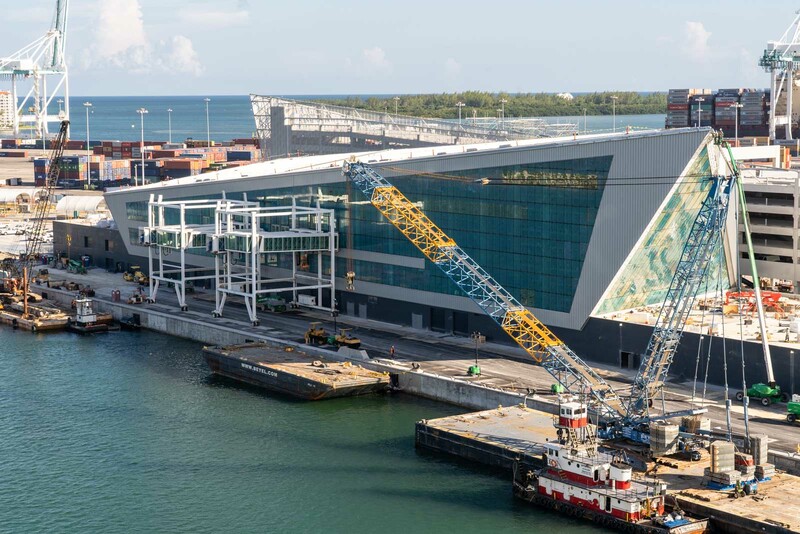 This will make PortMiami Royal Caribbean’s largest cruise port in the United States. 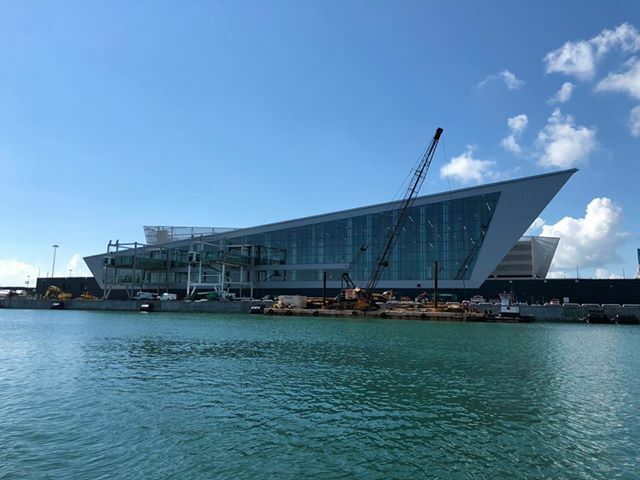 Royal Caribbean's new cruise terminal in PortMiami is coming along in its progress, and it appears that the gangways have been installed and dredging has moved further east along the pier. 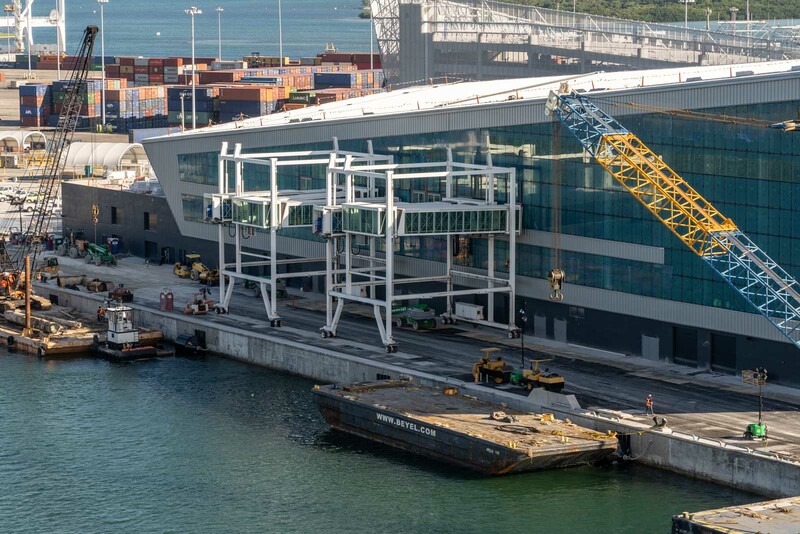 Thanks to Royal Caribbean Blog reader Twangster, we have these new photos to share of the progress being made, as seen earlier this week from Mariner of the Seas.